Throughout history, the culinary world has seen many inseparable pairings: Chocolate & Peanut Butter. Wine & Cheese. Cereal & Milk… to name just a few. Take one scoop of peanut butter ice cream and place it in between two chocolate cookies. Then roll the edges in a mixture of chocolate and peanut butter chips. MAKE YOUR OWN PEANUT BUTTER ICE CREAM: You can make your own peanut butter ice cream by mixing two tablespoons peanut butter, one quart of softened vanilla ice cream & a tablespoon of corn syrup. Take one scoop of pumpkin ice cream and place it in between two molasses cookies. Then roll the edges in a mixture of chocolate and peanut butter chips. Take one scoop of berry ice cream and place it in between two snickerdoodle cookies. Then roll the edges in a mixture of chocolate and peanut butter chips. Take one scoop of espresso ice cream and place it in between two cinnamon cookies. Then roll the edges in delicate chocolate shavings or for an added kick, ground up espresso beans. Take one scoop of honey lavender ice cream and place it in between two lemon cookies. Then roll the edges in edible flowers. Take one scoop of blood orange sorbet and place it in between two double chocolate cookies. Then roll the edges mini chocolate chips. Take one scoop of strawberry cake batter ice cream and place it in between two chocolate chip cookies. Then roll the edges in a rainbow sprinkles. 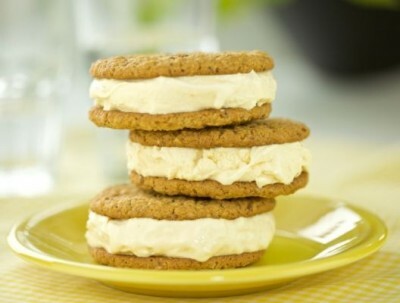 Take one scoop of banana ice cream and place it in between one cinnamon cookie and one oatmeal cookie. Then roll the edges in a toasted coconut. Take one scoop of Irish chocolate ice cream and place it in between two cinnamon cookies. Then roll the edges in mini marshmallows. Take one scoop of strawberry pineapple sorbet and place it in between two coconut macaroons. Then roll the edges in fresh coconut flakes. Take one scoop of berry sorbet and place it in between two peanut butter cookies. Have an ice cream or cookie recipe to share? Upload your recipe for a chance to win $250 from Archway Cookies! Visit the Archway Cookies BakeSpace Kitchen to add them to your network of friends AND to check out their $250 Archway Cookies Sweet Summer Cookies Treats Online Recipe Contest and pick up their $1.00 off cookie coupon!